In my previous post "Cisco ASAv 9.4.1 and ASDM 7.4.1 in Workstation / ESXi (1)", I tested the importing both OVA and VMDK file into Workstation and ESXi, but both ways failed. Those files are found and downloaded from Internet for only testing purpose. I believe those are good files and somebody has tested them. The only reason for my failure is because I am not using a right way to do it. In my old testing posts I have tested other versions such as 9.2.1, 8.42 and 8.02. 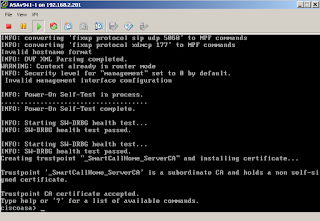 All were successful loaded in either Vmware Workstation or ESXi. "The OVF package requires support for OVF PropertiesLine 264: Unsupported element 'Property'." Following two links explains why , also both gives a solution , which is Vmware vCenter will be able to help load ASAv 9.4.1 into ESXi or ESX. 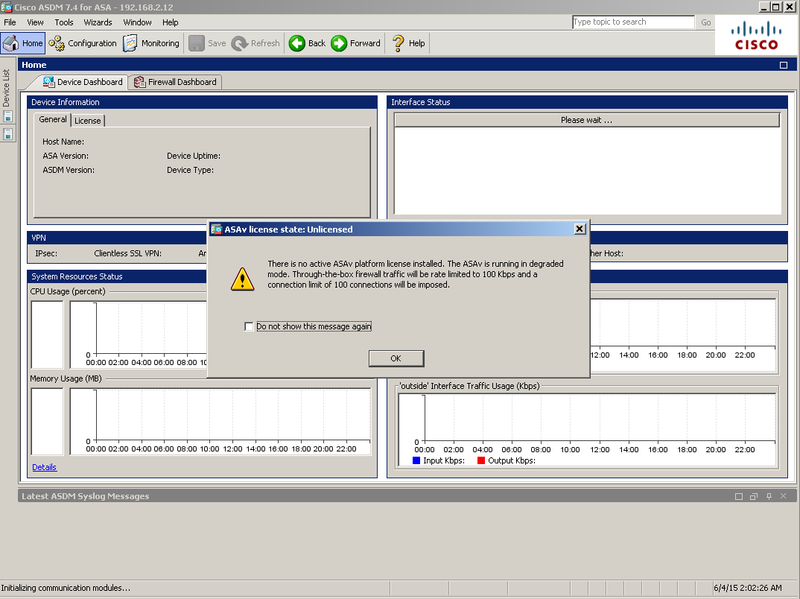 Actually Vmeare vSphere Client has to connect to vCenter first then deploy this asav941.ova into ESX/ESXi host. 1. 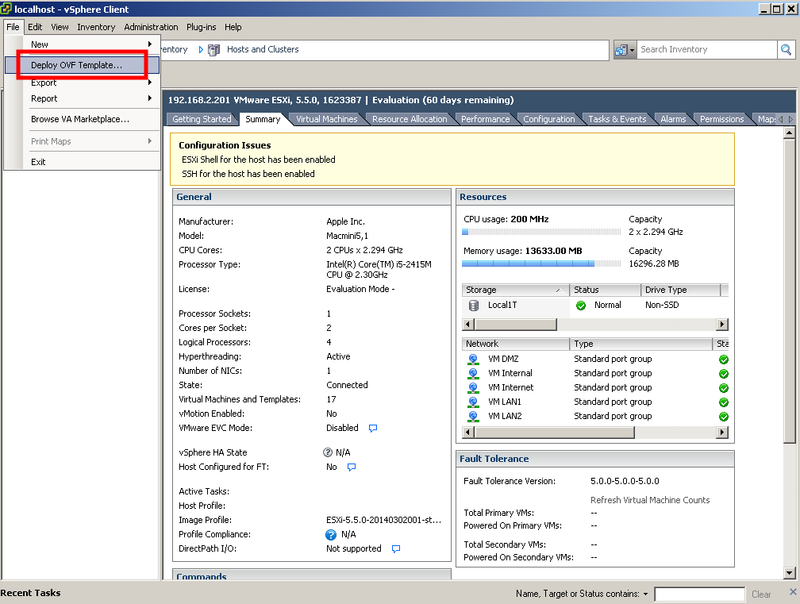 ESXi vSphere Client connecting to vCenter5.5. I am assuming you have installed vCenter as I did. If not, you can wait my next post to show you how to do it. I managed to install vCenter Appliance into my ESXi server. 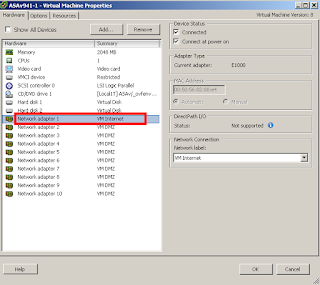 Acutally if you have vCenter in your environment, all procedures are same as deploying other virtual machines. 3. Choose downloaded asav941.ova file as the template. When license agreement window popped up, accept it then next. By default, there are 10 NICs and all of them are in same virtual network. In my case, it automatically set to connect to VM DMZ network. You can customize some or leave them as default. I did not tell too much difference for those settings. 8. 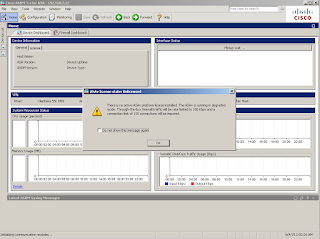 After 3-5 minutes importing process deponding on your connection speed, you should get a new VM in your ESXi. 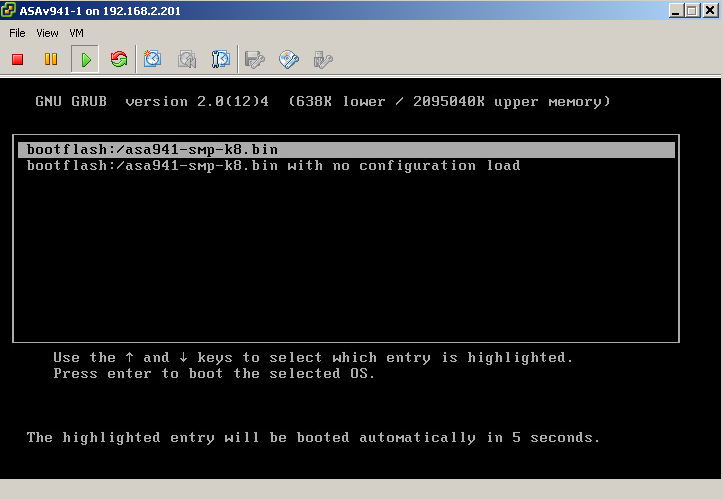 And you can power VM on and get booting window from console. During my full rebooting process, it will reboot itself once because some information is not consistent. I will try to record it next time. 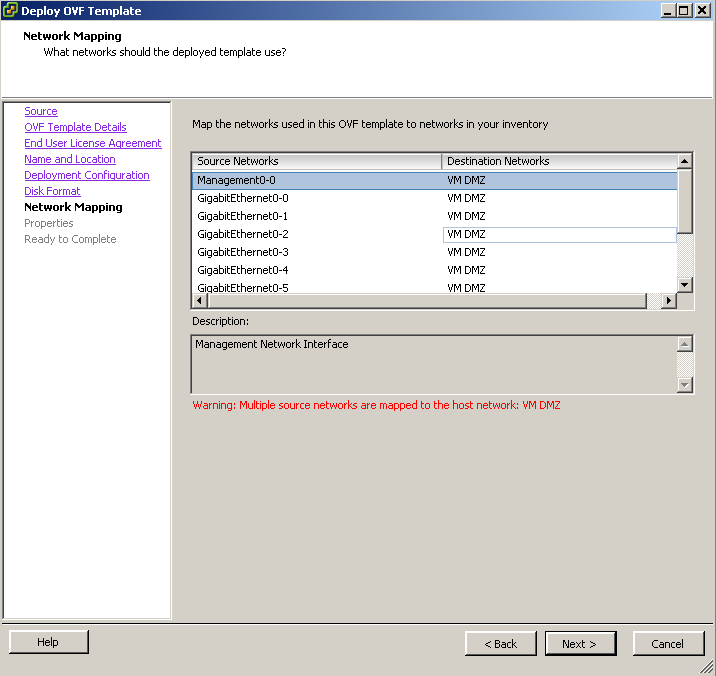 Interface management 0/0 is Network adapter 1. 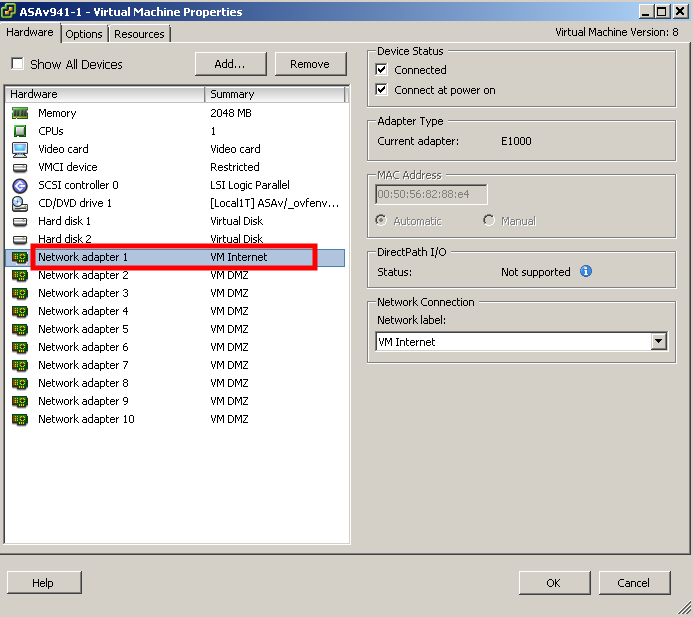 I changed it to VM Internet network to make management interface connect to my client pc network. 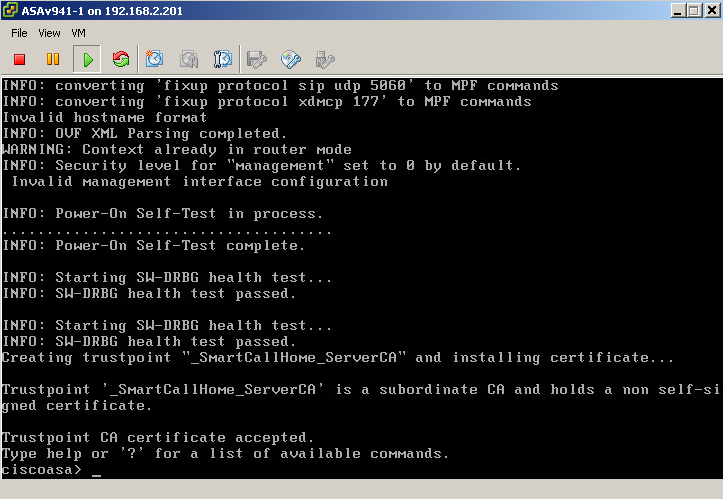 There are some basic configuration to get you SSH session enabled on your ASAv. System image file is "boot:/asa941-smp-k8.bin"
For failover deployments, make sure that the standby unit has the same model license; for example, both units should be ASAv30s. Since ASAv only support Smart Software Licensing, the old way in previous post to use Cisco ASA 5540 v8.2(1) Keymaker v1.0 to generate license activation-key is not working any more. There is no activation-key command. By default, the ID certificate is automatically renewed every 6 months, and the license entitlement is renewed every 30 days. Command "license smart register idtoken" will be the new command for register your ASAv. The ASAv default configuration includes a Smart Call Home profile called “License” that specifies the URL for the Licensing Authority. When you deploy the ASAv, you set the feature tier and throughput level. Only the standard level is available at this time. 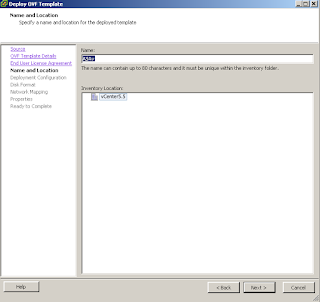 Also during deployment, you can optionally configure an HTTP proxy. 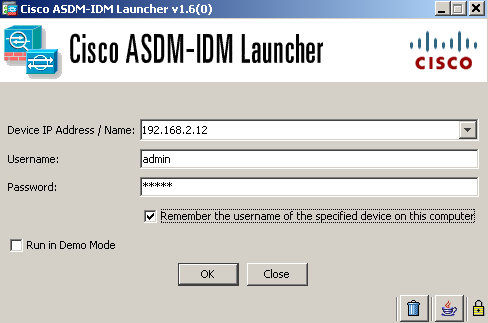 Click the button Install ASDM Launcher, type username admin and password cisco to download ASDM software on your local machine. You may be asked to install Java. 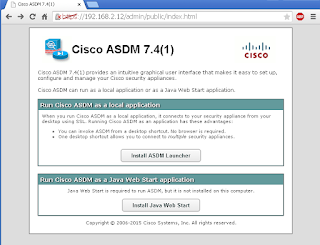 Hey man, I read your blog recently, I have a question about Cisco ASA. We have a Cisco 2911 Router with Security license. Two ports connect to dual ISP and one for intranet. PBR and IP SLA are configured on the router, We want to publish our FTP server to the internet so that our clients can access our Server via these two ISPs. But failed. 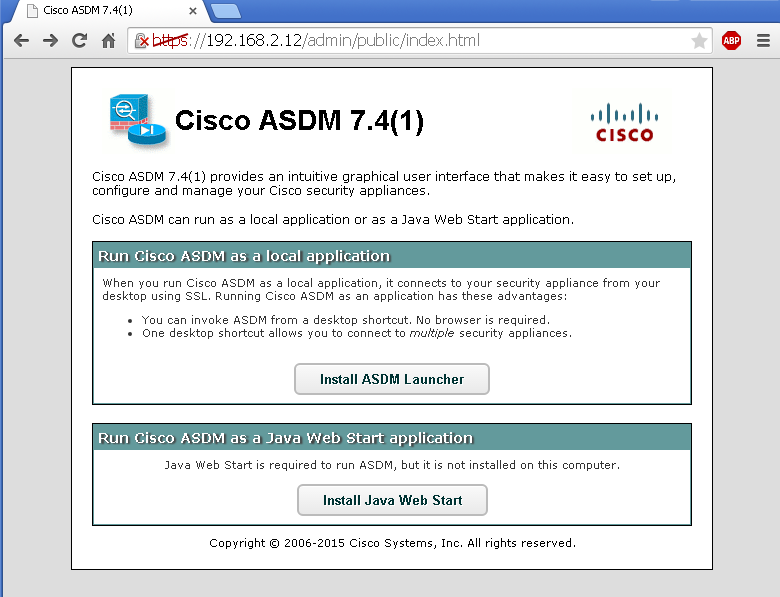 So I want to use Cisco ASA to test, My question is: Can I use a desktop to simulate ASA 9.4.1 to replace Cisco 2911? 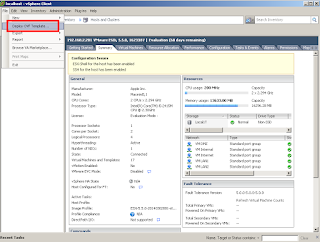 vASA9.4.1 has to be installed into vSphere ESX/ESXi system and managed by vCenter. If your Desktop is in the compatible list to install ESX/ESXi, you should be able to use a desktop to simulate vASA9.4.1 to replace your 2911. Of course you will need proper license for your vASA9.4.1 to unlock the limitation. What about the license in this package by default? It will be as "show version" that displayed in this page, right ? You will not need a license to play for all features listed in the show version screen. But until you install a license, throughput of your vASA is limited to 100 Kbps. WARNING: If access-list TW having destination "any\any4\any6" is used as match criteria for a route map, and applied to any routing protocol it will not have any effect. Instead use standard ACL or extended ACL without any\any4\any6 in destination. Any advise？ I am not sure if it is a bug, If I want this computer to go anywhere via the outside port, so I need to configure ANY as the destination address. It is not a bug. It is design for the route-map feature. ACL is of two types standard ACL and Extended ACL. They are the list of conditions that are applied to traffic travelling across interface. Acceptance and denial can be based on specific conditions. Really cool. But.. I need ASA 8.6 for testing and lab. Is it possible to run ASA 8.6 on wmvare or else? It depends on if someone worked on ASA 8.6 before. 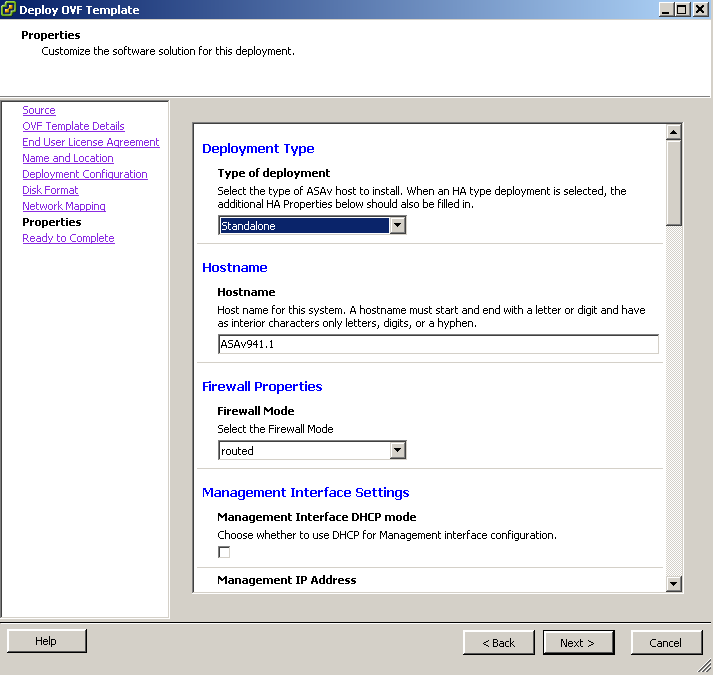 You wont be able to run original ASA 8.6 file in Vmware or other virtual system directly. So far, I did not see anyone tried to work on it. I do see lots of people using asa8.4.2 in vm. Is there any reason deploying from vshpere does not work, but from vcenter works? Is it possible you can export your ovf file, I think I should be able to just use that to make it work.